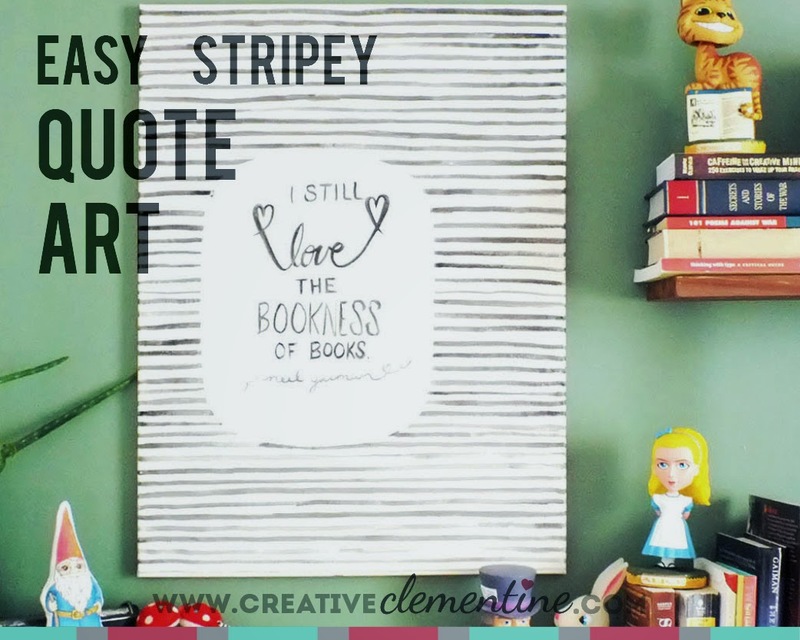 In the spirit of being thorough, I am popping by to show you how I made the cute stripey quote art in my Reading Room. This project can be summed up in very few words and steps. 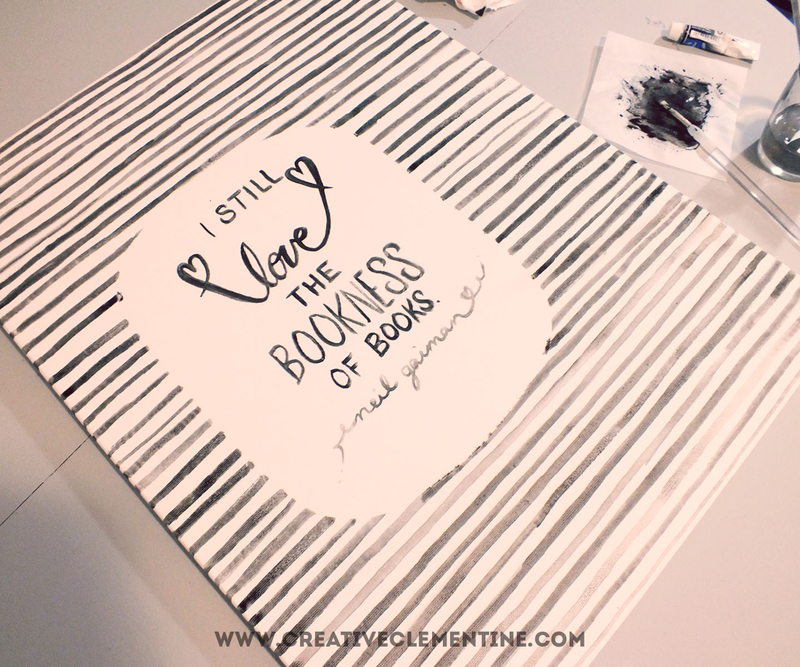 Pick a quote, put it on a canvas, and paint stripes over/around it. The less perfect it looks, the better. I chose a favourite Neil Gaiman quote. And, since it was for the reading room, it was a quote about books. Quite fitting, me thinks. I cut a rounded rectangle out of some spare contact paper, smoothed it over the quote, and proceeded with painting gloriously imperfect stripes. I opted for watercolours, which added a level of colour variance to the mix, too. Let it dry, uncover it, and voila! Perfectly imperfect wordy goodness. 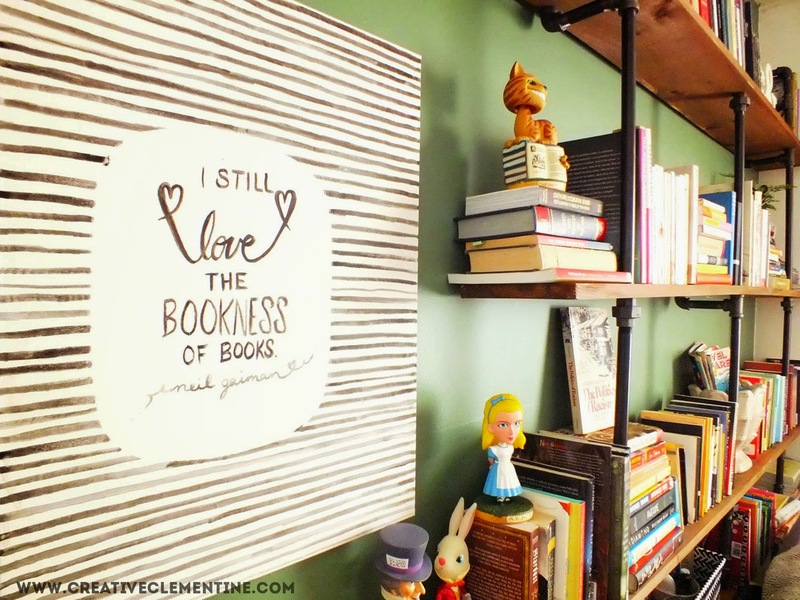 And a very appropriate DIY statement piece for a room filled with books. Using paint and a brush, write out your quote of choice on the canvas (middle-ish) as pictured. Try to cover only about 1/3 to 1/2 of the surface. Let dry. 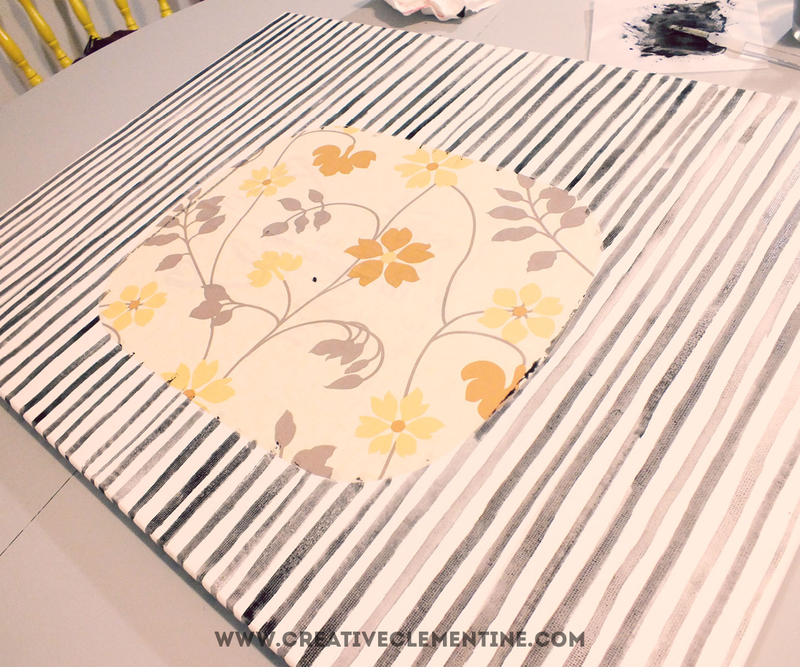 Cut any shape out of the contact paper, making sure it is large enough to cover the quote, but small enough to fit on the canvas. Adhere to the canvas over the quote. Run your nail along the edge to make sure it sticks. 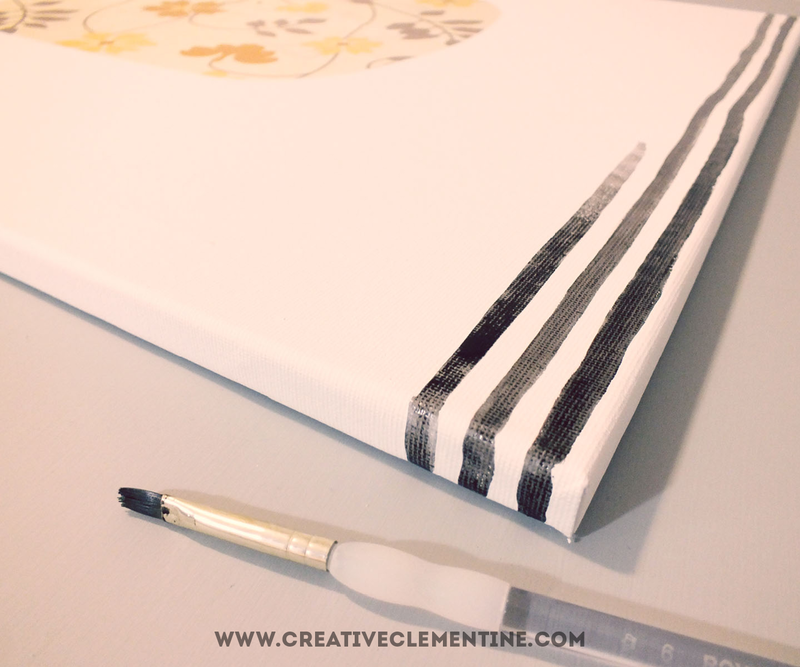 Paint stripes or your choice of pattern across the canvas as pictured. Paint right over the contact paper if you're worried the pattern won't match up. Repeat until the canvas is covered sufficiently. Once dry, remove the contact paper. Touch up if needed. 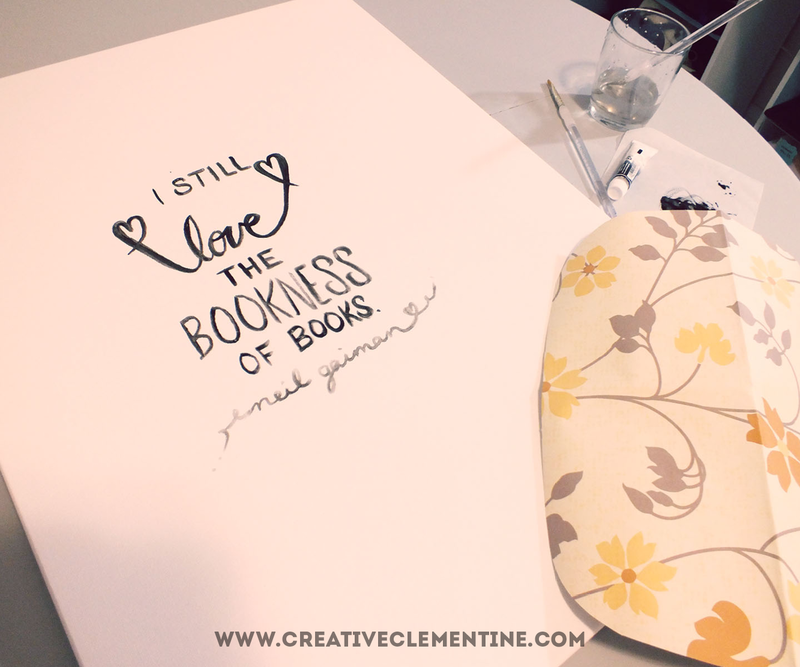 I love the bookness of books too! A kindle is great for holiday but there is nothing like the feel and smell of a book. And you can flick back to re-read more easily, especially those books that have a map or family tree at the beginning. Wow! Thanks! That's on the list of the coolest things anyone has ever said about something I've made. I love that style and the simplicity of black and white designs. Thanks again! This is super cute! I love how you created your own artwork. Thanks for sharing at Totally Terrific Tuesday! I hope to see you again tomorrow night. The party starts at 10pm! Jess @LiveRandomlySimple pinned and shared!